Ryan Kado – 2010 champion! and to all the newly license Formula Drift Pros!!!! JUSTDRIFT | charlie@justdrift September 27, 2010 | Comments Off on TOPDRIFT 2010 Champion! TOPDRIFT Rd 4 – Championship! I know some drivers are waiting for this… points to gain for FD licenses. Let’s get this done! 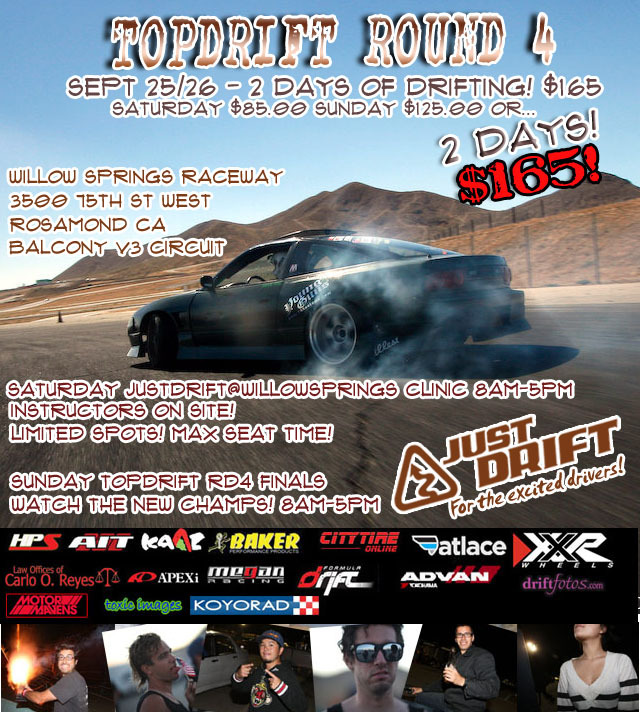 JUSTDRIFT | charlie@justdrift September 2, 2010 | Comments Off on TOPDRIFT Rd 4 – Championship! The winners of TopDrift round 1 and round 2 just received their brand new set of rims from XXR Wheels! David Briggs and Mike Bolanos the winners of the last 2 rounds of TOPDRIFT! just got their new wheels! Thanks Chris Sabando of XXR for the prizes! Awesome wheel company that supports grass roots! Everyone, support those who support the sport! Thanks again! – JD hearts XXR! JUSTDRIFT | charlie@justdrift September 1, 2010 | Comments Off on Thank You XXR! !